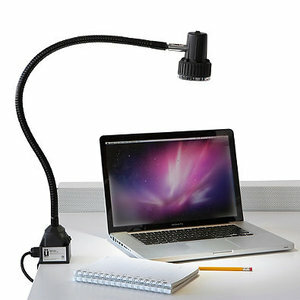 Use this UberLight Clamp Task Light to shed the right amount of light on the task at hand! Uberlight 2000TL is ideal for hobbyists, crafts, workbenches, industrial sewing & embroidery machines, and all types of tasks that require a concentrated amount of light without generating heat. 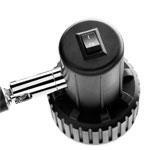 LEDs are the most efficient and lowest cost to operate lighting available. 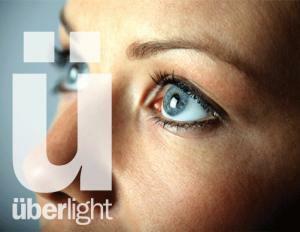 The UberLight 2000TL is rated for up to 60,000 hours of use. 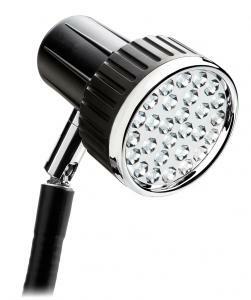 *NOTE: light comes with a wall plug for 110V. 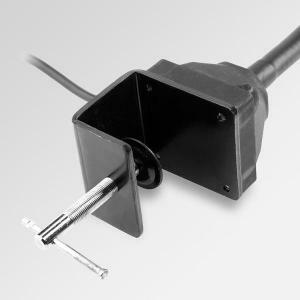 According to Reliable Corporation: These lights are able to work for 220V, however the plug is not supplied and the wire would then need to be connected to a switch or terminal block. CONSULT A QUALIFIED ELECTRICIAN to assist you with your electrical needs to avoid THE POSSIBILITY OF PERSONAL INJURY AND THE DANGER OF ELECTRICAL SHOCK OR FIRE. 1 Year Warranty on defects in material and workmanship. 60% LESS HEAT Compared with halogen bulbs, our LEDs produce up to 60% less heat, and are not affected by vibrations, making them the perfect choice for installing on equipment. REDUCE GLARE A proprietary honeycomb lens cover insets the bulbs by 5mm so there is no chance of the light shining in a passerby's eyes. The UberLight's PC board converts the AC input to DC, therefore no transformer is required. The on/off switch is located on the head of the light. 90% ENERGY EFFICIENT Compared to traditional incandescent bulbs, our 2000TL is up to 90% more energy efficient. MOVEABLE CLAMP The 2000TL comes with a metal (comercial grade) c-clamp that allows the light to be easily moved or mounted to a table. Each ÜberLight is shipped in a strong, UPS ready shipping box. Perfect for reading, computer use, hobbies, and work. screws (not supplied), attach the base to the surface. place over a hard surface and tighten so it is secure. degrees and side-to-side by 180 degrees. lights, 1 didn't work. Your CSR was very good and the malfunctioning light was replaced in just a few days, arriving just 1 day after the bad light was picked up. Very happy with the service and the product. The light is magnificent, the customer service stellar and am continue to be delighted with AllBrands. Thank you! I wanted to post a review of the light I purchased but I do not see the "full spectrum" Uberlight listed. Nevertheless, it is a magnificent light. My stars, I had no idea my sewing machines' lights were so dim until I turned on this sturdy lamp. Goes beautifully with the Juki TL-98Q I purchased from you. My thanks to you all for stellar customer service and always having the best prices. I have purchased form Allbrands previously. Will continue to do so in the future. 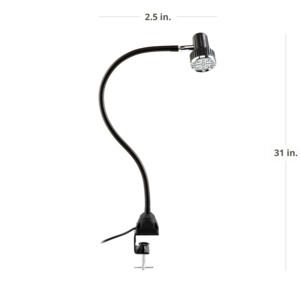 Through a referral from an online forum, I was recommended to purchase the LED light. The price was best all around. The product arrived 4 days later. I'm very very happy with the quality of the product. The gooseneck was very strong for craft use. Better than $160 LED light. Overall, very pleased w/ the purchase and will definitely buy from you guys again. The item shipped very fast and was of a higher quality than I expected. Originally I was not sure of the price as it seemed high. Then I received the item and physicaly saw the quality of the item. It was well worth the money. Absolutely great service. Shipped as promised and received in great condition. LOVE this light!